As was reported in today’s Broadway Briefing, Visiting Broadway is a new industry initiative that targets inbound tourists from top international markets. The program aims to get in front of those considering a visit—inspiring them to think about Broadway from the moment they start planning. So how did this get started and why is it so important right now? In 2018, a joint taskforce was created by the Broadway League’s International and Business Development committees to test international travelers’ response to advertising and see if a combination of paid search and display ads could drive traffic—and hopefully, sales. Although existing marketing programs like The Broadway Collection target International visitors via the professional travel industry, not much had been tested with direct-to-consumer advertising. With the League’s financial support and a custom landing page, ads were tested within three markets: Australia as a long-haul market, Canada as short-haul, and Germany as a non-English-speaking market. The League test, which ran last year from March 15 to June 15, was conducted with the expertise of Situation Interactive. It was a resounding success, proving that direct online advertising could propel international visitors to consider Broadway and purchase tickets from official sources before they arrived in-market. International travelers accounted for 21% of visitors to NYC in 2018, but a full 48% of visitor spending. 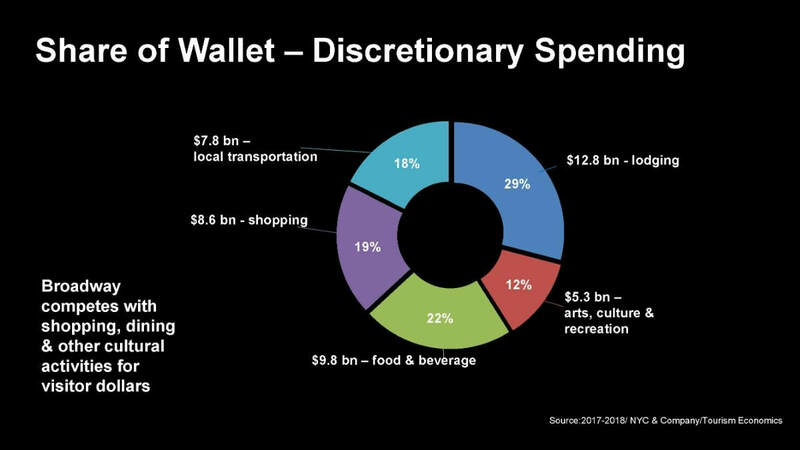 About 12% of that discretionary spending ($5.3B in 2018) goes to arts, culture, and recreation, and Broadway competes with shopping, dining, and other cultural activities for those visitor dollars. It’s important for Broadway to get out in front of these visitors and ensure that they allocate some of that spending to seeing a show while they’re here. And to get their tickets in advance. Be sure to go to www.VisitingBroadway.com to see the participating shows and get a feel for the initiative.